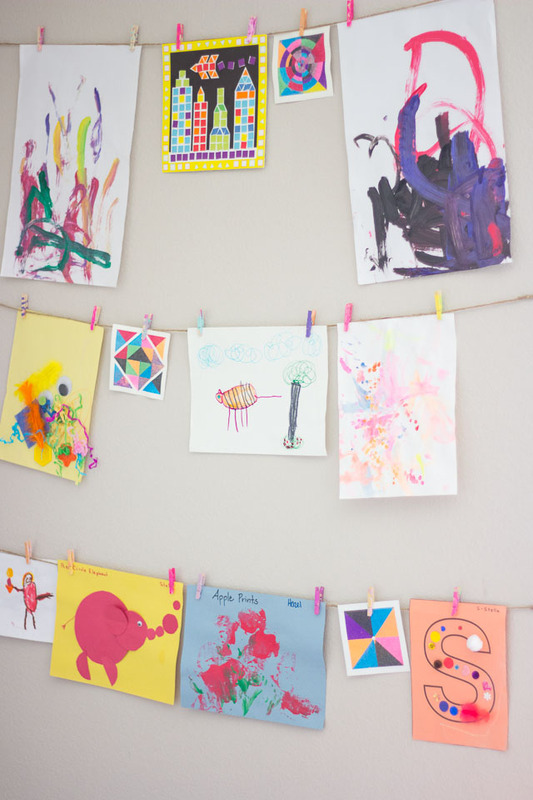 The Simplest Way to Display Your Kids’ Art! 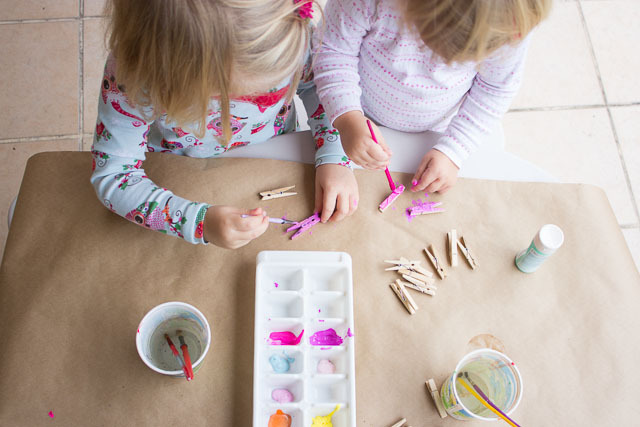 My girls produce a lot of “art’ – whether it is their own scribbles at home or the projects they bring home from preschool, I am always shuffling through papers trying to figure out what to do with everything. Truth be told, much of it ends up in the trash (although my 2 year old has an uncanny ability to find it there, and pull it out saying “Mommy why did you throw this away?!”). 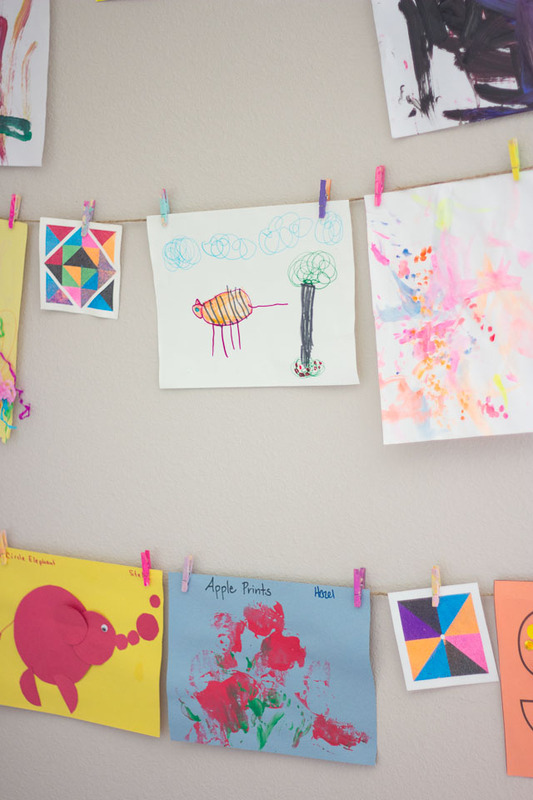 I came up with this simple art display in their playroom as a way for them to admire their creations a little longer before they were pitched or put into a closet somewhere! It is as simple as tying some lengths of jute twine to nails and adding some mini clothespins. 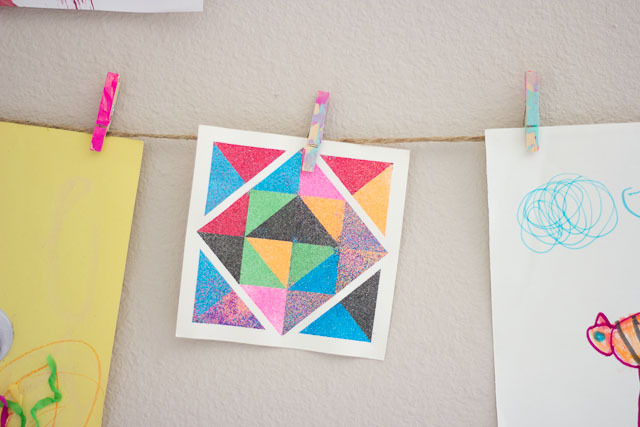 To make your own art wall in a matter of minutes, determine how many rows you want and then measure where the put the nails so they are spaced equally. I used small nails for this project. 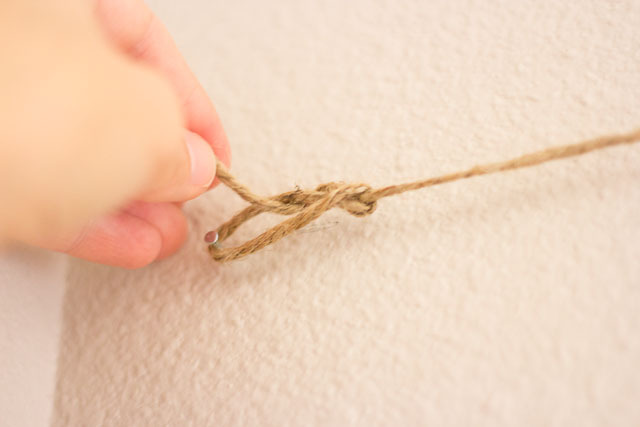 I then cut a length of jute twine and tied a knot around each nail, looping the twine through the not twice before tightening to give it extra hold. Make sure the twine is taught when you tie it, and then trim off any excess. 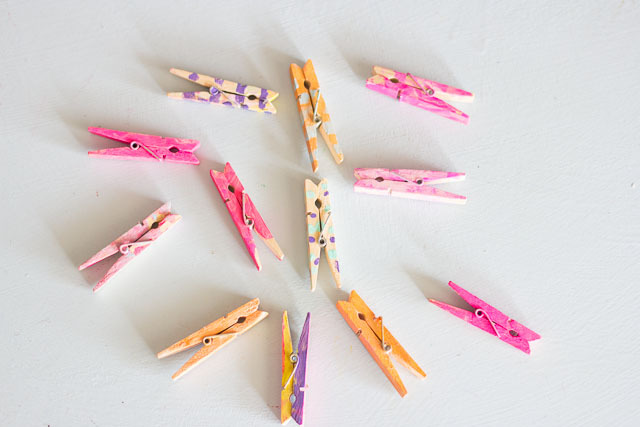 I found some mini clothespins and let the girls have fun painting them to give a little extra color to the art wall. 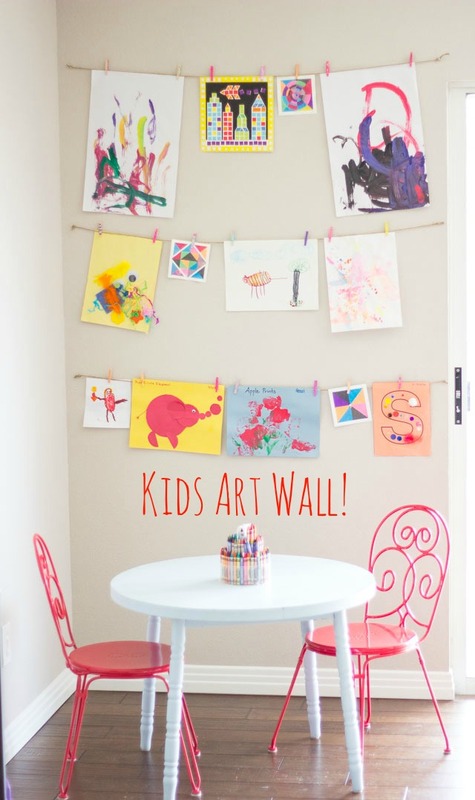 The art wall has become a rotating display in the playroom. It is right by their table so the girls can hang up something on their own once they are done. I like how it made their art the focal point of the room – all for just a couple dollars and a few minutes of time to put together! 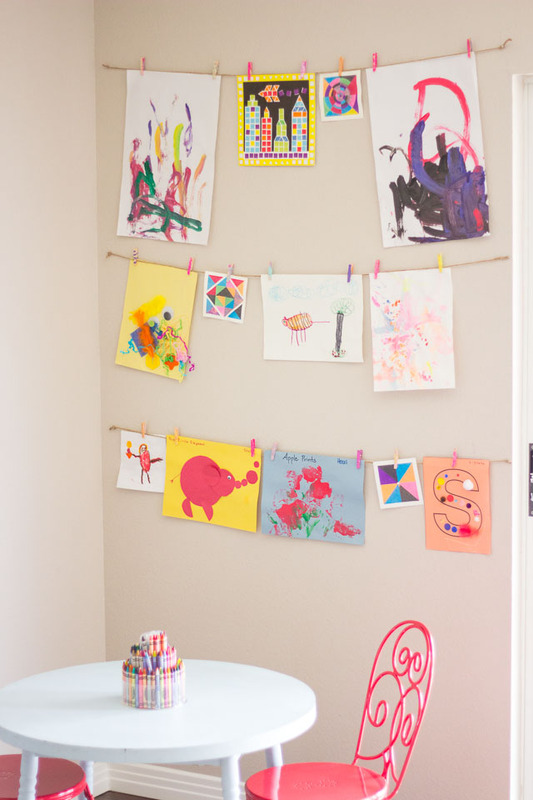 Want another idea for displaying your child’s artwork? Check out my kids artwork bunting! Disclosure: Amazon affiliate links are used in this post – if you purchase any of the items from the Amazon link I may receive a referral commission.